Our health resides in a delicate balance. Each and every day, the actions we take are leading us towards health or away from health depending upon the decisions we make. One week of “dirty bulking” or “falling off the wagon” can cause tremendous harm to our bodies that science is just starting to understand. No matter how healthy you may be, if you and I start guzzling strawberry sodas by the case for a week and go in to get our blood work done, we’d both likely be diagnosed with pre-diabetes pretty easily… and this is just in one week! Now, what if we were to stretch that out, say, six months? And this time, not guzzling strawberry sodas (strawberry was obviously my favorite), but instead simply consuming the processed, “wholesome” package foods that much of our society lives on today… what do you think would happen with our health? Well, my guest today knows exactly what will happen, because he had the courage to put this experiment to the test. Our guest today is New York Times bestselling author Drew Manning. He was an extremely fit guy who took the Pepsi Challenge (literally) and transformed his life in the most surprising way. His journey, from being a lifelong fit person, to packing on the fat like he was getting paid for it, to becoming incredibly fit again, became a real phenomenon that inspired countless people all over the world to take on their own journey to fit, and the results have been mind-blowing. You’re about to learn from Drew exactly how he put on major fat in just six months, and exactly how he shed it all off again in another six months. You’re going to learn about the inner battle that happens when you’re working to get back in shape, and some powerful insights to help you (or someone you love) to conquer them. What stands out about Drew is his heart, which I’m sure you’ll pick up on today. I’m truly honored to have him on and to be able to share this with you. Enjoy, listen with your head and your heart, and put these things into action for yourself. Why personal experience trumps everything. Why never having a weight issue created a separation between Drew and his clients. What foods Drew chose to eat that caused him to gain 70 pounds in just 6 months. Why the foods Drew ate changed the way his body operated. How it can be hard NOT to exercise. How exercise bulimia compares to a positive habit of exercise. How Drew’s weight gain began to affect the relationship with his wife. Why sleep apnea can lead to overeating and a drastic decrease in energy. How your energy and mood impacts your life overall. The huge revelation Drew had about why people become comfortable being unhealthy. Why the mental and emotional aspects of weight loss are far more important than any weight loss program. How drinking soda drastically impacted Drew’s mind and body. Some of the important things people need to do when recovering from food addictions and working to transform their health. How accountability can help you make breakthroughs in your health and fitness goals. What Dr. Oz had to say about Drew’s liver health due to his 70 pound weight gain. The startling impact that being overweight had on Drew’s confidence in the gym. You pick the best guests and that’s what makes your show #1. I’d love to see Dr. Josh Axe on your show- he has a great holistic health website http://www.DrAxe.com and does a lot of work with Leaky Gut syndrome which I know you’ve talked about briefly. Would be a cool topic to dive further into since It impacts weight, mood, energy, etc. Thanks, Shawn for this episode. I loved it! 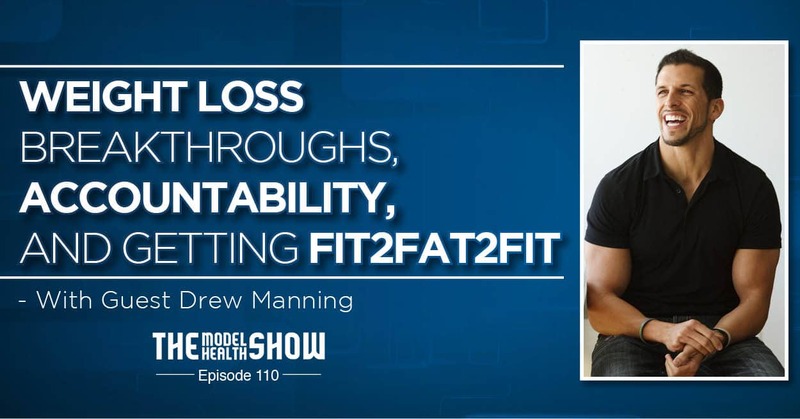 They say that it’s easier to gain weight than lose it, but I think Drew Manning made it both easier, considering that he led an active and healthy lifestyle since childhood. I just want to commend his wife though for supporting him all the way when he first took on the challenge, even though she’s pregnant at that time. It’s really not the best time to do that challenge. But still, great job for Drew. I think his experience will inspire a lot of people.